In just a few years’ time, the world went from phone books and flyers to Facebook and fast-fingered tweeting. Very few law firms made that transition right away. Many still haven’t. That’s due in large part to how busy attorneys are — and the fact that the social craze began with people who were still too young to apply to law school. But it’s abundantly clear that social media is no fad. It is a revolution — the predominate means of modern communication. Your law firm needs a social media presence. Attorneys are increasingly realizing the value in social media marketing, and those who make that investment frequently realize a return — but only when their efforts are deliberate and purposeful. At Network Affiliates, we orchestrate and execute strategic social media campaigns for law firms. Haphazard tweeting gets you nowhere. Too often, lawyers hop on the social train without a real game plan, and that can backfire. Social media marketing isn’t a gamble, nor is it a mere “add-on” service. We aggressively monitor our clients’ social media performance, constantly fine-tuning our approach, and produce consistent and measurable ROI. Social media marketing is a critical part of our full-throttled plan of attack for getting your firm new clients and better online results. Why Do Law Firms Need Social Media Marketing? Studies show that web users consider businesses significantly more trustworthy if they are engaged in social media. That is especially true among Millennials, who likely account for an ever-growing portion of your client base (or will soon). “Active” is the keyword here. If your Twitter account has 27 tweets and the most recent came from 2011 — or if your Facebook profile hasn’t added an image or posted something in months — your prospective client is likely to look for a different firm that is more engaged. Oddly, that is true even if the client doesn’t actually read or value what you post on your social media accounts. For many Millennials, merely seeing that you are active online is enough to translate to trust. After all, in today’s world, staying off of social media is like standing quietly in a corner at a party. It’s awkward and odd. Unlike most of our other legal marketing services, social media doesn’t always translate directly to new cases or clients. While you may occasionally have clients who found you on social media and make direct contact through that channel, most will come to you through your website or by making a phone call. Social media’s value, then, is more ancillary — but nevertheless indispensable. It’s all about building credibility and trust, especially with Millennials. If a client finds your website and then calls your office, we might not consider it a social conversion — but if that same client would have called someone else had you been inactive or standoffish on social media, you would have lost an opportunity. That’s a real risk. There’s search engine value here too. Google’s algorithms are designed to reward websites that appear helpful, credible, and authentic. An active social media presence can score brownie points with web crawlers. Most major search engines even cache, crawl, and index your public posts, which means that your old tweets and status updates can drive inbound traffic. Of course, some social activity can play a more direct role in building your business. LinkedIn, for instance, remains a valuable tool in connecting with law firms for referrals, as well as for finding bright new associates, paralegals, investigative partners, and other legal resources. YouTube, too, should be considered a powerful search engine all its own. Just as social media isn’t primarily a sales-driving force, it shouldn’t read or “feel” like a sales pitch. Social media is the new word-of-mouth marketing, especially for the under-35 set. If you want to reach those people, you have to be present, helpful, and engaged online. But no one wants to be bombarded by a sales pitch. They’re looking for inspiration, entertainment, assistance, and respect. Consistently provide them with all four of those, and you will see a return. Every single social media platform is an animal unto itself. It’s essential that your digital marketing agency have its fingers on technology’s rapid pulse. At Network Affiliates, we cultivate a unique voice for your law firm that differs from one platform or audience to the next. Just as a public speaker modifies his or her intonation and messaging for different audiences, your social posts must be sensitive to their format. 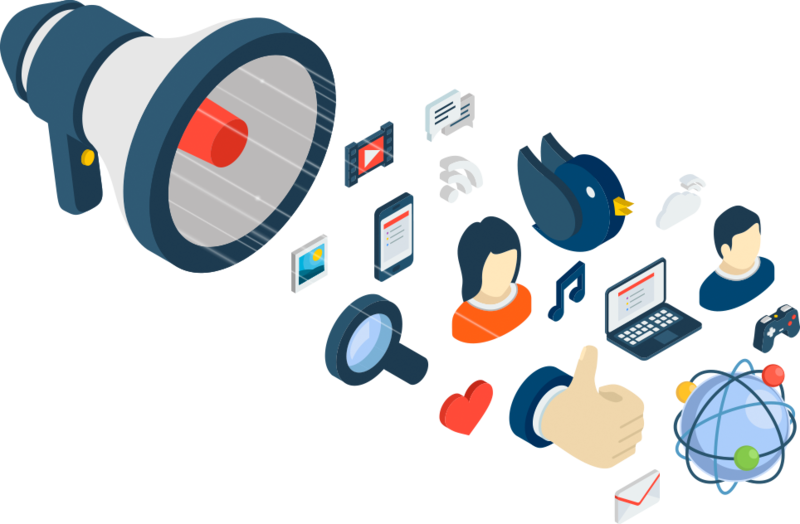 We make sure we know your audience, your platforms, and the approaches that pay off for each. Actively posting on social media is great, but it can backfire if you don’t follow up on your engagements with a response. If a user replies to your tweet and you ignore it, that reflects incredibly poorly on your firm. If a person spends time connecting with you online, we think it’s important to honor and harbor that connection. Respond to tweets, engage with Facebook comments, and reply to responses on your blogs. If someone leaves a positive review online, follow up with a thank you. (It might even lead to a testimonial you can use on your site!). Social media is all about interaction. By carefully and constantly monitoring all of your social media accounts, we can make sure that no opportunity for interaction goes unacknowledged. Your Firm Has a Voice. We Can Find It. If you were to sit back and study law firm advertising across this country, you’d find that so much of it is the same. That’s because most lawyers don’t actually understand how their firm is fundamentally different from others. It’s okay if you haven’t figured that out yet. Part of our job is digging deep and identifying your core values and key differentiators. Of course, no one knows your business better than you do. We’re here to help you tap into the assets that add unique and competitive value to your services — and then to communicate those effectively in various channels. There’s only so much you can do in 140 characters (or whatever the limitations might be in your platform of choice) — but by the same token, there is so much that you can do in 140 characters. Nearly forty years ago, Network Affiliates launched as a pioneer in broadcast advertising for lawyers. Since then, we’ve expanded into a full-service legal marketing agency, and our pioneering spirit continues online and beyond. We were among the very first agencies to make a big push for lawyers in the social media market, and we’ve achieved real results for our clients. With the right approach, we believe that we can consistently and reliably use ROI to expand your law firm’s business and its public profile. Social media use is growing more rapidly in the 55+ age group than in any other demographic. So those firms that still believe social media is only for “young people” aren’t right anymore. Social media drives decision-making, and if you aren’t on it, you aren’t part of that process. Want to learn more about our social media marketing for law firms? Give us a call. We can help.